To cater for a growing demand for flexible and economical ventilation solutions suitable for a wide range of performance requirements “Ventilation Systems” recently upgraded its VENTS VKP EC series of fans with electronically commutated (EC) motors. The VENTS VKP EC series is now available in a range of new standard sizes (300х150, 400х200, 500×250, and 500×300 mm) while a wider performance range of 3 350 to 11 190 m³/h allows for more precise model selection to match the specific ventilation requirements of the serviced space. The fans are intended for high-performance ventilation systems where energy efficiency and low noise are essential. While being perfectly capable of providing ample air supply to classrooms and office spaces the VENTS VKP EC fans are also well-suited for private swimming pools. The fans benefit from electronically commutated motors – the state-of-the-art technology in terms of energy efficiency. These units take 1.5-3 times less energy compared to the conventional DC motors. The low noise characteristics of the VENTS VKP EC fans help achieve high levels of occupant comfort. 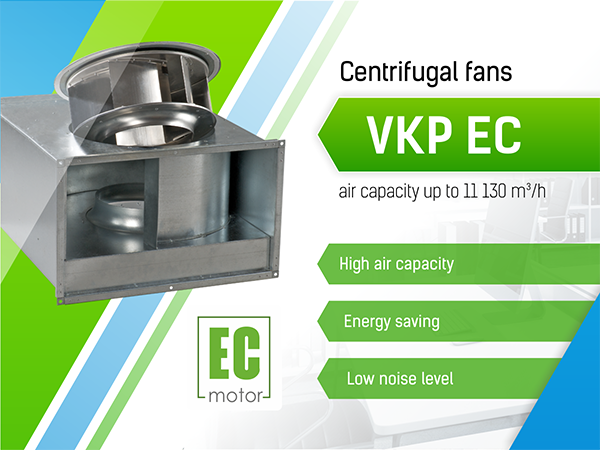 The control interface of the VENTS VKP EC fans is intuitive and user-friendly. Air flow is adjusted automatically depending on the control parameter changes such as the temperature, pressure or smoke content. For example, while responding to temperature changes the air flow is automatically adjusted if the temperature exceeds the pre-set threshold value to maintain an optimum air quality according to the user-defined settings. If necessary, several VENTS VKP EC fans can be combined into a single network for convenient centralised control from a single workstation. A special software allows monitoring all the ventilation system parameters, controlling the fans with a high level of accuracy, and programming each device on the network individually for maximum flexibility. Such functionality is especially needed for ventilation systems of public buildings. To keep abreast of the current market trends and meet the needs of its customers VENTS is constantly updating its product range. By expanding the VENTS VKP EC family the company is offering even more flexibility in creating optimum ventilation solutions for a diverse variety of spaces.